Thailand, Malaysia, Singapore, Brunei, Cambodia, Vietnam, Indonesia, Philippines, northern Australia, Honduras, Hawai`i, and perhaps a few other tropical locations on the planet. Harvest seasons vary in different areas depending on local climate, latitude, and altitude. 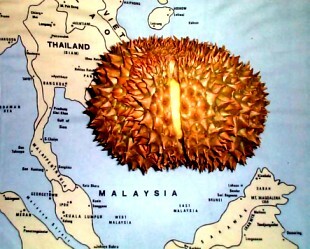 In Southeast Asia durians are generally available in the marketplaces from late April to early October, with peaks in Thailand in May or early June (though the season persists into autumn), and in Malaysia sometime between June to August. Brunei's rare species of durian mature in October. Hawai`i's durian season appears to be early November. Obviously, if you are in the tropics and are able to, grow your own. See cultivation pages. You can often find imported air-flown frozen Thai durians in Oriental food markets in large cities in North America, Europe, Southeast Asia — and in Honolulu's Chinatown. Durians freeze well, either in the rind or just the pulp sections removed from the fruit, and Thailand exports large quantities of frozen durian around the world. Quickly deep-freezing the fresh pulp (aril) to a temperature of -11º F. [-24º C.] allows keeping it for up to 3 months.